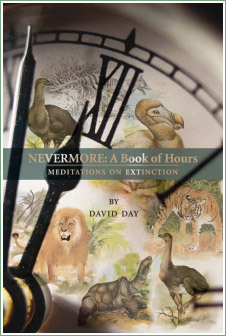 David Day is a poet and author who has published 40 books of poetry, ecology, history, fantasy, mythology, and fiction. Born in 1947 in Victoria, British Columbia, Canada. After graduating from Victoria High School, he divided his time over the next decade between work in logging camps and mines, and study in university. His first book of poems, The Cowichan, was published in 1975, and he graduated from the University of Victoria in 1976. He lectured in Greece and worked for the Canadian Publisher McClelland and Stewart in Toronto. In 1978, Day moved to London, England, and has subsequently made his living as a full time professional writer. Since then he has lived variously in England, Greece, Spain and his native Canada. Day has been published in magazines and newspapers worldwide. He has also been a magazine editor, a columnist for the Daily Mail and Punch, a scriptwriter for television, a playwright for theatre, and a dramaturge for the Royal Birmingham Ballet. His books have won numerous literary awards and been selected as "Books of the Year" by Time Magazine, New Scientist, Parents Magazine and the Observer. David Day's books – for both adults and children – have sold over 4 million copies and have been translated into twenty languages. His most recent books include Nevermore: A Book of Hours (Quattro) in 2012 and Decoding Wonderland (Doubleday) forthcoming in 2015.